Childhood was a riot of colours...colours so bright that its luster is still the same...all the memories are etched in our mind and heart, like it happened just yesterday! That era was a different world!! When things were simpler, people were genuine, friendships were real, worries were meager, love was pure, conversations were not superficial, and praises were not mere words, when money was secondary, when success was one of the many aims, when children were meant to be children, when mocking others wasn’t in vogue! Today’s world is all jumbled up! It’s as if gone upside down. Doubts reign over faith! Hatred reign over love! Finding logic to everything and then getting nowhere is the finest thing to do. Something that has no meaning is appreciated the most. Men having no values rule the rest of them. I miss my childhood!!! 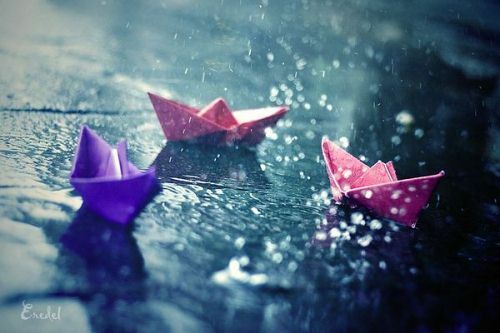 I miss those carefree-fun filled days a lot... but most of all, I miss them when it rains... no matter where I go, I don’t see paper boats sailing in the roadside water streams... and my heart sinks lower!!! What has this era done to the kids? Where is that innocent childhood gone? Ah!! The Famous Summoned By Bells Visited..
Man, I got sooo nostalgic reading this post. I wish those days would be back.. but alas! I miss my childhood too. our fun was real...these days its more superficial...!! !